Liverpool’s Georginio Wijnaldum has returned to training today after missing out on Monday night’s draw against Manchester United through injury. The Dutch star picked up a hamstring injury while representing the Netherlands during the recent international break. 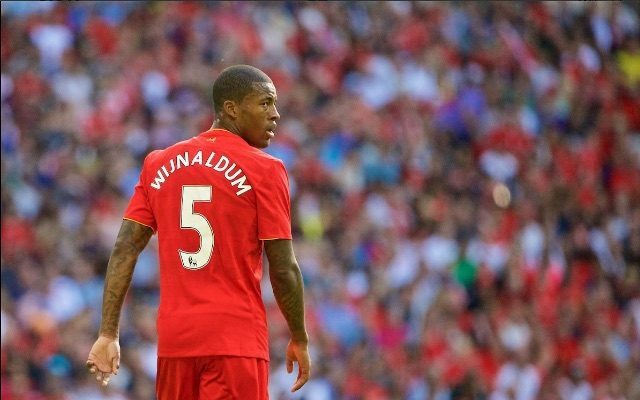 Wijnaldum took to Twitter to let fans know of his return to first team training ahead of this weekend’s Premier League game against West Brom. His return to action acts as a great way to move on from the disappointment of Monday’s draw and look ahead to Saturday’s fixture. The 25-year-old was a key absentee for Jurgen Klopp’s side and will re-inject the additional attacking intent that has seen him improve Liverpool’s midfield since his summer move from Newcastle. His ability to receive the ball on the half turn and initiate attacks quickly will be welcomed back into the side with open arms. This will be important in breaking down an inevitably packed West Brom defence in the way Liverpool were unable to do against Manchester United. Emre Can replaced the injured Wijnaldum on Monday and, despite taking a while to get going, eventually impressed in his first start of the season. The return of both men is sure to heat up the healthy competition for a spot in Klopp’s midfield. It’s good to finally have all of our players returning to full fitness.